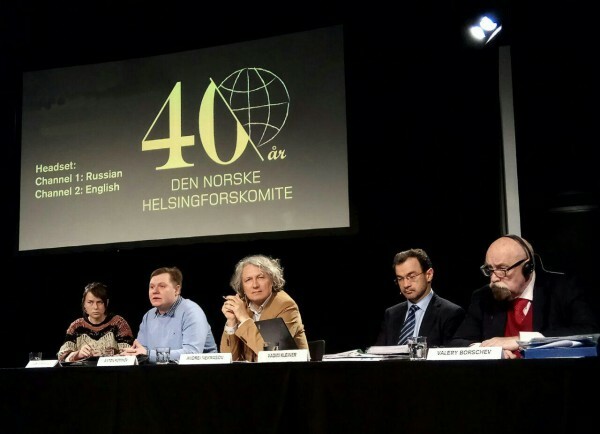 At the Q/A following the premiere of my film, "The Magnitsky Act - Behind the Scenes", in Oslo in June 2016, the Deputy Secretary of NHC Gunnar Ekeløve-Slydal put forward the idea of a hearing on the Magnitsky case. I welcomed it with enthusiasm and we, together with my colleagues at Piraya Film, went on to discuss it for quite a while. We agreed that it should be impartial and balanced, in terms of the choice of speakers and agenda. Well, today at this event, I am, basically, alone, outnumbered by, probably, a factor of 20. It would be disingenuous not to recognise that every speaker here, apart from myself, represents Bill Browder’s version of his Russian activities and Sergei Magnitsky’s role in the affair. And - five minutes is all I am given to present my case. 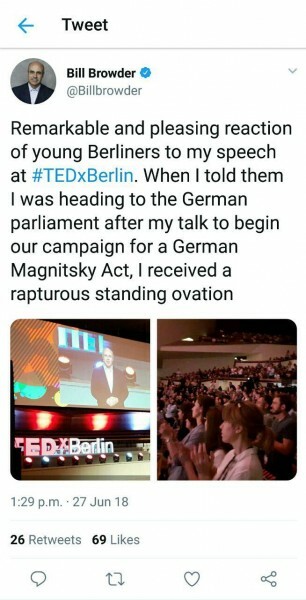 This event is completely biased also because in its Dossier (sent to all registered participants, while I, by the way, have only received it last night) Browder's version is presented as the objective truth about the case, while the whole point of such a hearing should have been to look impartially at the story from all angles. Instead the story I dispute is painted as axiomatic fact, while my findings, which I worked on independently for many years, are called “defamatory allegations” perpetuating “Russian government disinformation”. 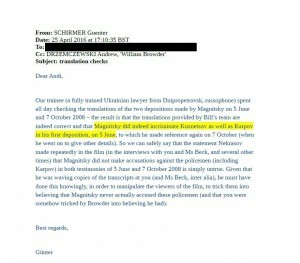 The Dossier contains a list of claims the film allegedly makes, each followed by a “rebuttal”. Instead of allowing the film to speak for itself NHC (which has declined to show the film) interprets the film’s findings in the way it sees fit for the “rebuttals”. But interpretations themselves are wrong! And I am not given the time to elucidate what is supposed to be my version of the events, before we even get to the so-called rebuttals. They are of course replete with misrepresentations as well. Who is the author of this damning analysis of my work – Norwegian Helsinki Committee? Who at the committee has been watching the film, reading and analysing its documentation to interpret it in the way it is interpreted in the Dossier? Who was providing other documents for the Dossier and interpreting them? I want to know that, because I want to confront this expert on specifics he or she should understand, while I wonder why he or she has made so many mistakes? And why such an obvious bias? The only explanation I have is that the expert is Mr Browder or a member of his team. If I am wrong it would be nice and fair to be introduced to my mysterious prolific opponent before this hearing is over, thank you very much. 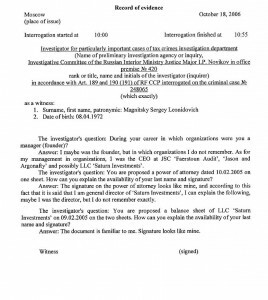 How many of you have clicked on this link to Magnitsky’s investigation? This sounds important, doesn’t it? I am known for claiming Magnitsky didn’t actually investigate anything, so NHC seems to be proving me wrong here. Well if you do click you see something signed by a certain Paul Wrench. No trace of Magnitsky. So where’s the evidence Magnitsky investigated something? And who is Paul Wrench then? He’s a professional figurehead director fronting many different off-shore firms including those which were controlled by Bill Browder. Paul Wrench’s signature is on the complaint to the Russian authorities claiming 230 million dollars was stolen with the help of police. Paul Wrench was questioned about this complaint, under oath at the U.S. District Court Southern District of New York on Sept 25, 2015. He said the only person he recalled discussing the content of the complaint with was Ivan Cherkasov, a U.K. based partner of Bill Browder. Again, no sign of Magnitsky. So Paul Wrench seems to be the first person to report the 230 million dollar theft. So is he our whistleblower? Here I’d like us to think what it exactly means to be a whistleblower. 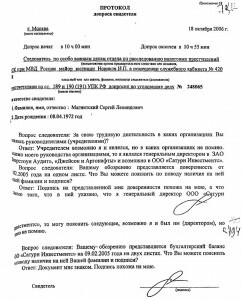 At the same time as this complaint appeared, the story was published in a Russian newspaper (Vedomosti, № 2158 on July 24, 2008). The article was actually more detailed than Paul Wrench’s complaint. So if the tale of a theft of 230 million dollars involving police was so dangerous for them to arrest and kill Magnitsky (IF he’d been the one to report it), what happened to the journalists who in reality reported it? The answer is – nothing. Moreover a few days later (July 29, 2008) it was… suspense! - Bill Browder himself who told the terrifying story of the theft involving police – on a Moscow radio station! Again – no repercussions for those who aired this story. And more media information followed. Mr Browder was telling me and the whole world that Magnitsky had reported the theft of 230 million dollars on Oct. 7 2008. That is, after all those publications about the theft in the Russian media. Even without them, saying something about a theft would not have been significant or dangerous, unless Magnitsky had some real evidence. And Mr Browder did try to claim that Magnitsky had actually proven the money had been stolen by the police. 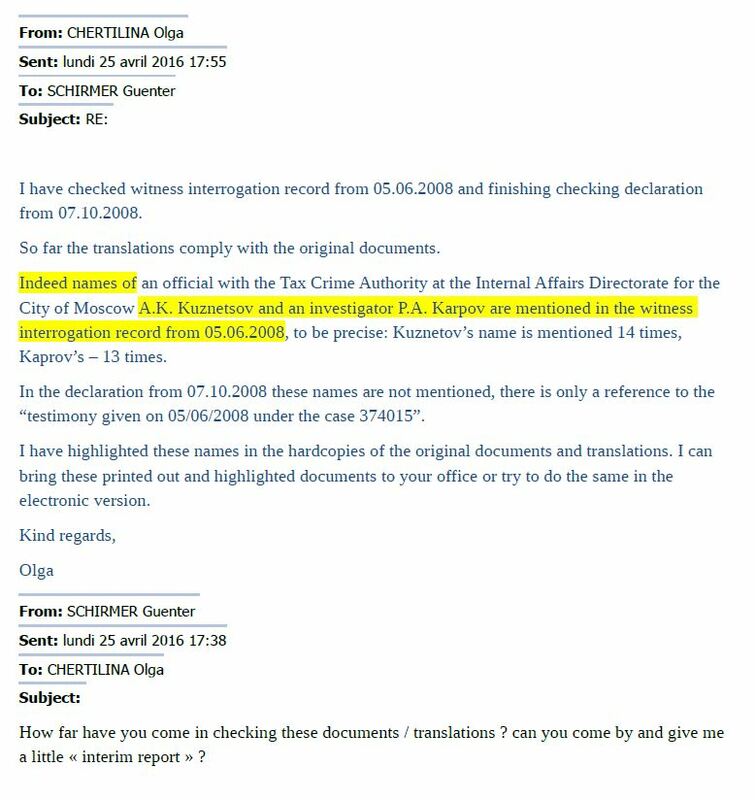 But not only is there no such proof, the document Browder refers to as Magnitsky’s exposing the officers’ involvement in the theft of 230 million (a transcript of the police questioning of Magnitsky on Oct. 7 2008) does not even contain their names. But Browder and his team themselves only called Magnitsky whistleblower retrospectively. There’s an interesting video they created, uploaded on Oct 8 2009 (just a month before Magnitsky's death), on Youtube channel „Hermitage TV”: “Hermitage Reveals Russian Police Fraud." Magnitsky had been in Russian gaol for over 10 months by then, tortured for his whistleblowing every single day, according to what Browder is saying now! But not at the time. Browder just mentions Magnitsky briefly, calling him a consultant, but there's not a word about Magnitsky’s investigation, accusation of police, police trying to force him to withdraw accusations and all other things Browder is now saying he knew well at the time. When I said to NHC that they relied in my view a little too much on Mr Browder’s sources, they referred to such an authoritative document as the Magnitsky report by the Parliamentary Assembly of the Council of Europe. Surely, that should be independent and very well researched. 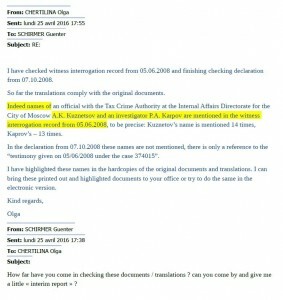 The report, signed by a well known Swiss politician Andreas Gross, is included in its entirety in the Dossier. 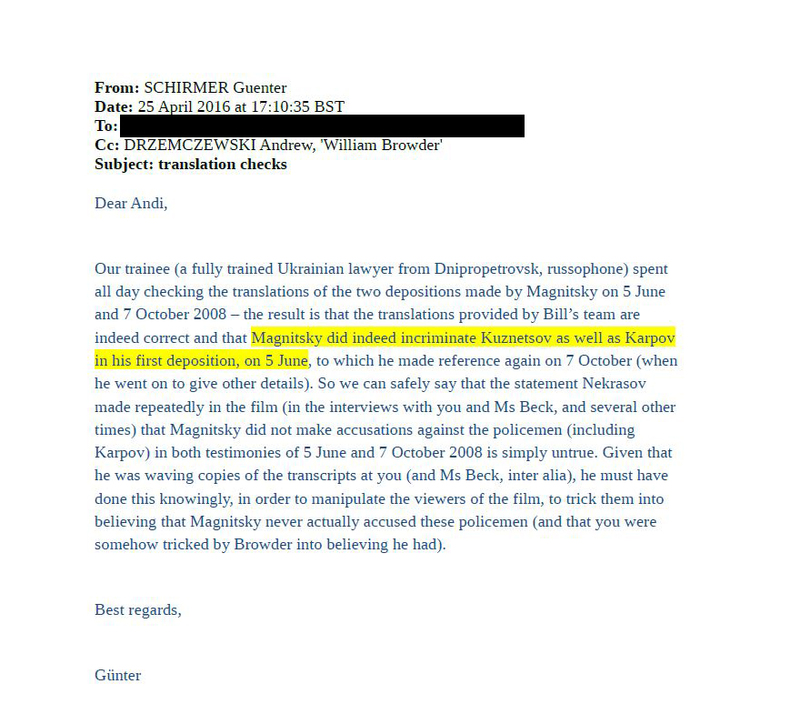 Well, in my film, Mr Gross admits that all crucial Magnitsky documents came from Browder’s sources. He also says that U.S. did not investigate the case before adopting the Magnitsky Act, though Browder “must have delivered them something”. In addition Andreas Gross admits that Magnitsky was not killed, but died of negligence. 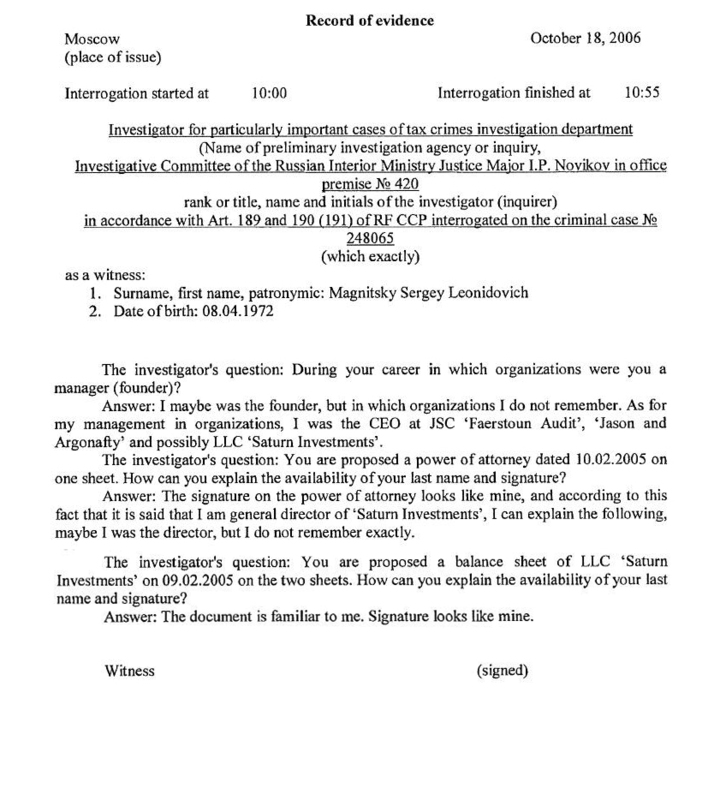 "5/6/2008: testimony by Mr Magnitsky accusing Lt. Col. Kuznetsov and Major Karpov of involvement in the company thefts and tax reimbursement fraud." This statement, which refers to the key issue of one of the most divisive narratives of international politics, is simply false. 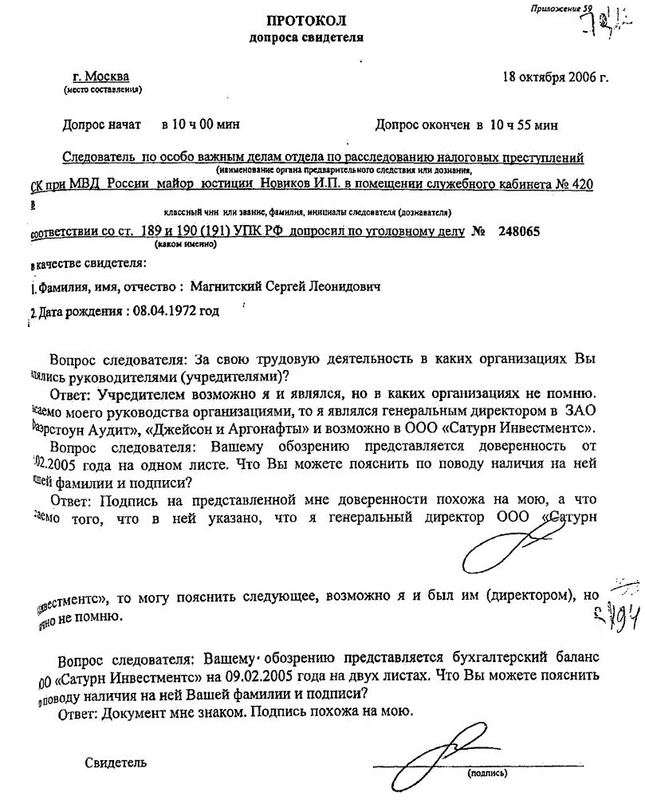 Magnitsky did not accuse Kuznetsov and Karpov of the crime at the centre of the Magnitsky case - the involvement in the tax reimbursement fraud, neither on this date (“5/6/2008”) nor on the date (Oct 7 2008) Mr Browder claimed he did. The Browder team has been misrepresenting Magnitsky's answers to an investigator (that's what his statements are, not a pro-active whistleblower testimony) on June 5 and October 7 2008, and I wrote a statement for the U.S. Congress (Page 63) to elucidate the matter. It is astonishing that the Parliamentary Assembly of the Council of Europe tolerates this level of incompetence, or worse: improper influence by a financially powerful individual under investigation in the case. “It… suffers from a lack of trustworthiness, having read it. (...) There doesn't appear to have ever been an actual hearing conducted following the dissemination of Gross's report or any drafts of his report." While Gross cites certain conversations he had with Russian officials and the documents he received from them, those references are eclipsed by the statements and opinions by Browder, Hermitage, and other self-interested parties." “Meanwhile I am beginning to think that we are all just a part of the Browder PR machine (...) Here I will just quote from The Man Who Shot Liberty Valence (a 60s Hollywood classic movie - A.N. ): When the legend becomes fact, print the legend." # Lucy Komisar's article "The Man Behind the Magnitsky Act"
# Robert Parry's article "A Blacklisted Film and the New Cold War"
Детали запоминаются, а суть забывается. Пиво было Beck's, настоящее, из Германии. Бар – где-то на у пересечения шестой и четвёртой. Девушки две, одна блондинка, другая брюнетка, с длинными волосами и синими глазами. Обе были года на два меня старше, а мне было 23. Первой со мной заговорила брюнетка. Девушки были немками. Узнав, откуда я, они сообщили, что знают ещё одного русского в Нью-Йорке. Затем, с минуту говорили между собой, на непонятном тогда языке, поглядывая на меня. Что-то, таким образом, обсудив, брюнетка спросила, не хочу ли я провести вечер в их компании, тут неподалёку, у того самого русского. Дорога заняла минут 10, включая покупку вина. Было холодно и сухо, наверное, зима. То, что мы идем в гости к русскому поэту – мне сказали, то, что его зовут Иосиф Бродский – нет. Барышни явно не знали насколько он был знаменит в СССР. Кажется, они рассказали, как с ним познакомились, но этого я не помню. Бродский был улыбчив, приветлив, прост и говорил сначала лишь по-английски. Обо всём – политике, литературе, кино. По мере того, как я хмелел и терял робость, я начал позволять себе русские аллюзии и цитаты. Тогда и Бродский стал переходить на русский, забывая о немках. Помню, речь зашла о том, как влияет эмиграция на поэта и прозаика. Он сказал, что считается, что прозаику труднее за рубежом, так как он теряет связь с родным социумом, в то время как поэт может писать о безвременном и общечеловеческом. На самом деле, наоборот. Поэту нужен контакт с живым языком страны во всех его проявлениях, контакт как бы физический, прямой, сонорный, вербальный – психологический; а прозаику легче пересидеть в логике, сюжетах, абстракциях – то есть в памяти. Вывод: писать стихи по-русски в Америке ему нелегко. Ещё он сказал, что если бы ему было столько лет сколько мне, он бы с головой окунулся в изучение античности – языков, литературы и истории. Запомнил я, почему-то телевизор в маленькой спальне, закреплённый на кронштейне на высоте человеческого роста. Думаю, что в спальню я попал, так как через неё шёл путь в единственный в этой небольшой квартире туалет. Я виделся с ним ещё один раз, и несколько раз мы говорили по телефону. Обсуждали возможность съёмки фильма с его участием. Он согласился, но когда я был готов, оказалось, что он основательно занялся своими зубами, или челюстями, и был, в буквальном смысле нечленоразделен. В этом состоянии он даже взял трубку, чтобы так и сказать, мол, ты же сам слышишь, это не отговорка. О его смерти я узнал в Петербурге, на том самом Васильевском острове, куда он так и не вернулся.